BSVP was delighted to sponsor the recent “Pathology Festival” at Nottingham Vet School on Saturday 2nd March 2019. This event was open to vet students from all vet schools and highlighted the wide range of career paths available in veterinary pathology. The event was a great success with about 80 people in total attending, including students from nearly all of the UK vet schools and Dublin, and from all year groups. A handful of qualified vets also attended who are thinking of moving into a career in pathology. 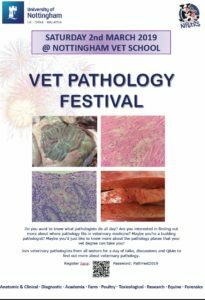 Thank you to the organisers for putting together such a great day inspiring the next generation of veterinary pathologists.